I can't believe that the last time I wrote a baby update my son was only just rolling over! This kid has really taken off since then! It's amazing how quickly he is learning new things! For a while there he was doing a really good army crawl but still pushing up to hands and knees and trying to figure out all fours crawling thing. Now he is at a point where he is really good at and prefers the all fours crawl but I sometimes still see the army crawl from time to time. He is pulling himself up to standing and I have seen him get distracted with something with both hands and will just kind of prop himself up against wherever he is standing so he clearly feels pretty stable. 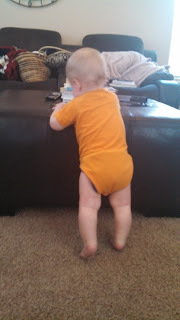 I'm sure it will be no time before he is standing completly unsupported at least for short periods of time. When you hold him by his little hands he will move his feet and 'walk' around. He will also 'walk' along a piece of furniture while he plays. I have even seen him move from one piece of furniture to another if they are close enough and he can transition with one hand on each piece. I almost wonder if he might be an early walker. We will see. Wow, does this kid love to eat! He is getting really good at it too! He uses his little pincer grasp to pick up small bites of food. It amazes me to see him handle his food. Sometime he will get a small bit in the palm of his hand but he knows how to kind of roll it up along his fingers to get it where he can pop it in his mouth or he will just open up his hand and use his pincer grip with his other hand to pick up the piece and get it to his mouth that way. This whole baby lead solids approach (letting baby self feed right from the beginning) was a real mess in the beginning but not so much anymore. I could probably get away with skipping the bib, he rarely gets food on himself. He can even eat really soft food like a banana or sweet potato without making much mess on himself. I have tried to offer every kind of fruit, vegetable, and meat I can think of. In addition to the foods I mentioned last time he has also now tried peas, cauliflower, butter nut squash, yellow summer squash, cucumber, mango, blueberries (a favorite! ), raspberries, blackberries, strawberries, canned peaches, ground beef, ground bison, ground goat (yes we eat things like that around here), pot roast, salmon, grilled chicken and chicken liver. I'm sure I'm forgetting some. I just try to eat a varied diet as much as I can myself and share whatever I'm eating with him. He loves it all! We have been doing a little part time elimination communication for a couple months now and it's going really well. He always poops in the potty now. I don't even remember the last time I changed a poopy diaper (how awesome is that?!?). He clearly knows what the potty is for and what he is supposed to do. When I put him on the potty now if he needs to go he will relax and go right away and when he is done he looks and me and lifts up his arms to be picked up. "Ok, I'm done! Thanks Mom!". It's kind of awesome! It is such a joy to be this little guy's Momma. I just love watching him learn and explore the world and watching his personality unfold. It's just so amazing. He is just a baby, still so unformed in so many ways, and yet he is a whole little person in that little body. It's all right there. His personality and temperament are all his own. And I get to be witness to that unfolding. I feel so proud of this guy and honored to be his Momma.